Quality management systems (QMS) are used in order to ensure that the quality and safety of products is maintained. In the automotive sector, these systems are governed by the quality standard ISO 9001 and the system standard ISO/TS 16949. Maintaining these strict standards without the assistance of CAQ software and well-trained employees is virtually impossible nowadays. This aspect becomes even more evident when one takes a closer look at the latest revision of the ISO/TS 16949. The system standard ISO/TS 16949 describes the requirements of a quality management system (QMS) for serial and replacement part production in the automotive industry and can be seen as a necessary add-on to the ISO 9001. The OEM members of the International Automotive Task Force (IATF) require that their suppliers are certified according to ISO/TS 16949 and approximately 30% of all international carmakers demand that their suppliers fulfil the requirements formulated by the IATF-members (BMW Group, Daimler AG, Fiat Auto, Ford, General Motors, PSA, Renault, Volkswagen AG). One of the reasons why managers in the automotive sector should have a closer look at their quality management is the roadmap that the IATF has laid out for the ISO/TS 16949. On 14.09.2018 the validity of all so-called transition audits will end and existing ISO/TS 16949 certificates will become invalid. If one considers, that all internal audits, management evaluations, gap analyses as well as at least 17 documented processes must be performed and documented by then, this is a very tight schedule. The revised system standard now called IATF 16949:2016 is based on the new ISO 9001:2015 and therefore has adopted a variety of the changes that were implemented in its recent revision. The “quality management” topic has, for instance, reached top management as the responsibility now lies at executive level and it can no longer be passed on to a management representative. Other changes include a new structure (High Level Structure) and a greater focus on topics such as risk management, responsibility, and employee competence. The emphases of the IATF 16949:2016 are, apart from customer satisfaction and risk analysis, continuous improvement and error prevention, waste reduction in the supply chain, and adherence to legal and administrative product safety regulations. The standard applies to all products and processes in the company and covers the entire value chain of the automotive industry. The scope includes all production facilities of the manufacturer as well as all suppliers. Some of the changes made during the revision include a non-delegable responsibility for the QMS, enhanced requirements regarding the safety and quality of products, and new compliance requirements regarding corporate responsibility and code of conduct. Maintaining standards such as IATF 16949:2016 is difficult with pen and paper or MS Excel solutions alone. Contemporary CAQ-systems such as CAQ.Net® by CAQ AG Factory Systems are tailor-made to meet these requirements as they offer everything that is needed for sophisticated quality assurance and management from Control Plan, SPC, and inspection planning to initial sample inspections, gauge management, or the risk management tool FMEA in one software solution. One of the main factors for being able to successfully uphold the regulations of the IATF 16949, is data transparency. 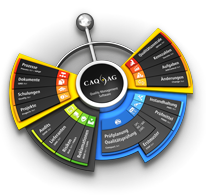 With CAQ.Net® said transparency is achieved by having instant access to all data relating to the quality assurance procedures along the entire production chain. This means that, for instance, data from complaints can be used directly during inspection planning, locked gauges cannot be used for inspections, and the FMEA is connected directly to the production control plan. The entire quality management system is monitored via a central quality control module. This allows the user to select individual persons, customers, suppliers, articles, machines, or processes and receive precise, real-time feedback regarding the data of the selected entity from throughout the entire system. Successful IATF 16949 certification in the automotive sector requires an all-inclusive management solution that covers all quality-related facets from product design to complaint management and safeguards consistent compliance and traceability. This solution must incorporate all aspects of quality management and facilitate the adherence to valid standards and guidelines. This solution is CAQ.Net®: the all-inclusive management solution for the automotive sector.